To make the original Vincotto, grapes of Negroamaro and Malavasia grapes, which have been left to wither on the vines for 30 days are pulped and cooked. Hence the name Vin Cotto - cooked wine. The created grape must is reduced to one-fifth of its original volume and aged in oak barrels for up to 4 years. Vincotto is alcohol free and has no coloring or preservatives. 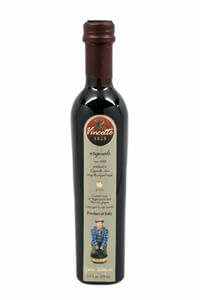 Vincotto Originale is sweetest of the Vincottos and can be uses in the same way as the balsamic vinegars; drizzled over meats, desserts, in salads and sauces, over fruit and salads.